Here's an easy shamrock Hawaiian quilt block St. Patrick's Day card (easy if you have a cutting machine). Requires patience to hand cut. 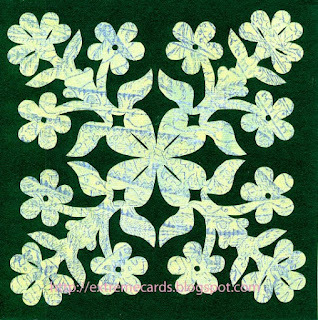 I started with the letter "c" from the dingbat font Hawaiian Quilt2 and modified it with shamrock and heart shapes. Download cutting file PDF or DXF (opens in Silhouette Studio) or SVG. To hand cut, follow these instructions from tongs-paper-cutting to fold your paper and use the template.